With Cashmere Twill the Acqua di Biella brand inaugurates a new line of fragrances "Le Vie della Lana", a new unparalleled range of products of the highest quality, based on the old recipes of the Reale Manifattura but also on the most advanced scientific and dermatological research that draws together the precious components of the finest wool and of the best quality, strictly vegetable primary materials. Described as a "warm and enveloping perfume", Cashmere Twill is a unisex scent featuring notes of essence of wool, raspberry leaves, bergamot, lemon, iris water, magnolia, cardamom, anise, cedar, vetiver, white moss and ambrette seeds. 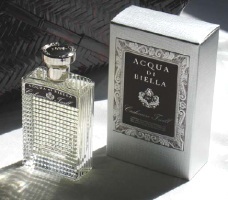 Other recent launches from Acqua di Biella: Ca' Luna. Is it just me, or does that bottle look remarkable like the plaid Burberry bottles? Maybe if the Burberry bottle and the Cartier cap ran off together and let their love-child sleep on a waffle-iron. This could be very nice or very boring from the notes. I am not sure that “cashmere twill” makes any sense. Is there such a thing? LOL at the waffle iron! And beats me — I know zero about fabrics. Twill refers to the way a fabric is made- when I think of twill, I think of tweed. So the idea I get is of a really luxurious tweed blazer, soft and warm. Doesn't seem like an appropriate spring/summer image, though! I love the idea of a fragrance smelling like wool, but I don't think this would be good on me. Seems like there'll be more of them, though! Interesting concept. That makes sense! Does sound more fall than spring, I guess. I like the idea too — and curious about “essence of wool”. Wool is comforting, but it has to go with the scene. I'll never forget this, one morning here when it was bitterly cold, grey, dirty snow on the ground, and you know it's just going to be a evil commute. I got in my car wearing a merino wool jacket, carrying a tumbler of hot milk chocolate. I also had some lavender oil in a kleenex stuffed into the vent. The combination was really nice, it was a bit steamy from the hot milk, the chocolate, the lavender, and the wool underneath it all. It was a great scent. I don't know if I would wear that in a perfume, perhaps a roomspray, but it has to be a winter scent. Wool in the summer … makes me itchy and sweaty just thinking about it, how uncomfortable. Seems like an odd scent to bring out in late spring. Doesn't it sound wintery? It looks a bit like the Safari for Men bottle…. Thank you. Today I have Chez Bond on one wrist and Green Irish Tweed on the other. They are both very green. TS, gosh, that sounds like something I *would* wear as a perfume! It is DISGUSTING here today! Any a/c would be too much a/c. And yay Vent Vert, of course! Only the wool part, maybe? And hard to say how prominent that is in the scent…perhaps it is not very noticeable. But a wool-ish scent does sound great for winter.